Pay close attention to tattoo symbols and meanings when you get a tat from another culture or language. Misinterpretations can cause some tattoo regret. 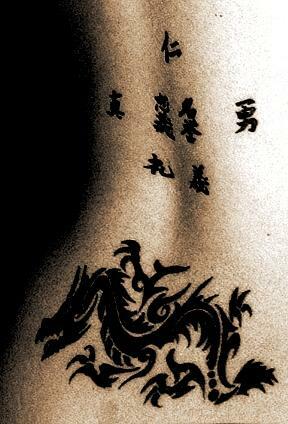 Amongst the most popular tattoo designs are symbols and characters which stand for a variety of other words or attributes. This may include Japanese characters, animals that symbolize a trait the tattoo wearer wishes to embody, Zodiac symbols or symbols from another culture entirely. The allure of these tattoo symbols and meanings is the ability to adorn oneself with a character or trait whose meaning is not readily apparent. For example, wearing a Chinese character for home on the wrist gives multiple layers of meaning. There is the character itself, which may have some interest to look at. There is the literal translation of the word, and there is also the deeper meaning which the wearer attaches to it, such as a longing for a home, love of a home life or the stability which the home represents to them. However, there can be a danger in using a tattoo symbol with multiple meanings. When you begin the consideration process for a new tattoo, make sure to also give a lot of thought and research into any tattoo symbol you may be interested in. There are several ways the use of a symbol may backfire, causing tattoo regret. Unless you are fluent in the language you are taking a symbol from, make sure you double check its true meaning before you get it tattooed to your skin. Characters and symbols from Arabic, Russian or Chinese alphabets are all popular tattoo choices, but all of these can be applied incorrectly. Don't take your tattoo artist's word for it that the symbol you are considering has the meaning you desire. You may be horrified to discover a symbol you felt meant one thing is actually something else long after the tattoo has healed. While some areas of the body display a tattoo in only one direction, there are some areas such as hands, legs, wrists and feet where the angle the tattoo is viewed from can change its meaning. Flipping a symbol upside down so you can view it properly may mean that someone standing across from you may get a different meaning entirely. Take orientation into consideration when you plan your tattoo. If you're planning a tattoo of an animal, plant, flower or other image that represents multiple traits, keep in mind that the meaning you attach to the symbol may differ wildly from other people's perceptions. While you may like the idea of a spider web tattoo simply for its punk rock connections, a viewer may interpret it to mean you've been in prison, have an addiction of some kind or belong in a gang. While the ultimate meaning of any tattoo is always up to the wearer, keep in mind the viewer may still bring baggage to it as well. When you find a symbol that speaks to you, do some further research into it. What other meanings does it represent? Does orientation change its meaning? Are you comfortable with any other meanings that can be attached to it? When properly thought out, tattoo symbols and meanings can add nuances of interest and depth to the design. Take care that this is the result of your new tattoo, and not misinterpreted regret.